A bleak but compelling look at the future beyond the nuclear holocaust. Ben, who has a telepathic ability to control animals, leads a hazardous existence in the bush west of the Blue Mountains. Hopeful of a kinder life in the city, he escapes to Sydney - only to be futher disillusioned. Then, at the heart of the city, he comes upon Taronga Zoo, which has been strangely unaffected by the general chaos. Or has it? Is it an island of safety in the midst of so much danger? Or is it really the most sinister place of all? 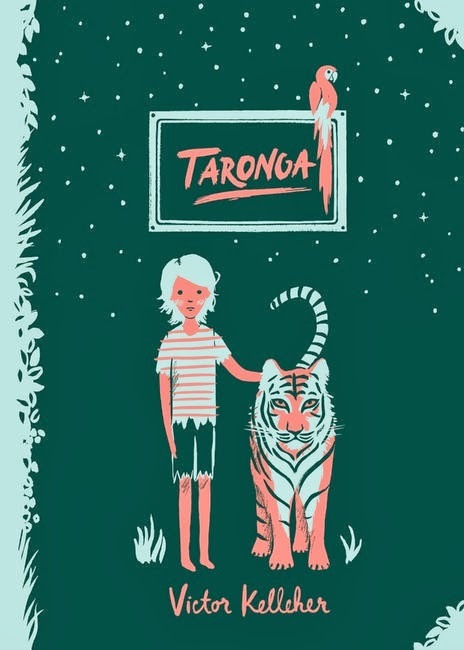 I thought I would start my AusReading blog posts with Taronga, as I think it may be the one book out of my 5 that people are the least familiar with, and it just so happens it might be my favourite of the 5! It might seem like an amazing skill to have, to get into the mind of an animal and make it do what you want it to, but to Ben it’s a curse. It’s wrong to force any living thing to somthing against its will. What happened before, ‘the last days’ is never fully explained, but that’s part of the beauty of this book, and the thing that makes it work as well today as it did 20+ years ago. The other major character in this story is Raja, the male tiger. He is the only animal that mentally fights Ben when he tries to get into his head. Throughout the course of this story we see the resistance lessen and both Ben and Raja realise that they are actually the same, both being held prisoner, both being forced against their will. I hope I don’t put anyone off by saying that I think this book will appeal to readers of the Hunger Games. It’s not the same storyline by any stretch, but there’s something about the survival instinct and the determination of Ben and his desire to do the right thing that reminds me of Katniss. There’s also the idea that human life is expendable. Brona mentioned the questionable cover of this new edition, and I would have to agree with her. This is at times quite a violent and dark story, but this new cover makes it look like it might be a nice story about a boy and a tiger. The other thing about this new edition is that it’s a hardback. A hardback is great for people that want a nice edition of a classic novel, but I’m not sure it’s the right choice for giving this book a new lease of life with teenage readers. See below for earlier cover images. Post apocalyptic seems to be the theme for AusReading Month - you, Nancy & Shannon! I'm not immediately drawn to animal stories, but this one sounds fascinating - a psychological study almost? It really is worth a read, and I wouldn't describe this as an animal story, so don't let that put you off.